After 6 years of Skyhawk operations, 70 more airframes, a mix of A-4Bs and A-4Cs, were ordered by Singapore in 1980. These were shipped to Singapore for rebuilding, and the A-4Cs emerged as A4S-1s while the A-4Bs remained in storage for use as spares. In total, around 150 airframes, all A-4Bs and Cs, were purchased by Singapore. Along with a number of TA4S-1s, these newer Skyhawks joined the 2 Skyhawk squadrons as attrition replacements from 1982. A further order of 16 stored TA-4Bs in 1983 resulted in conversion to 8 TA4S-1 trainers. By this time 143 Sqn had moved to Tengah AB as a result of Changi being converted to an international airport, and in 1984 a third squadron, No 145 (Hornet) was formed, also at Tengah. 1985 was a bleak year for the Skyhawks. In a matter of months, 4 had been written off in separate accidents, and the situation was further blighted by low serviceability of the remaining aircraft. 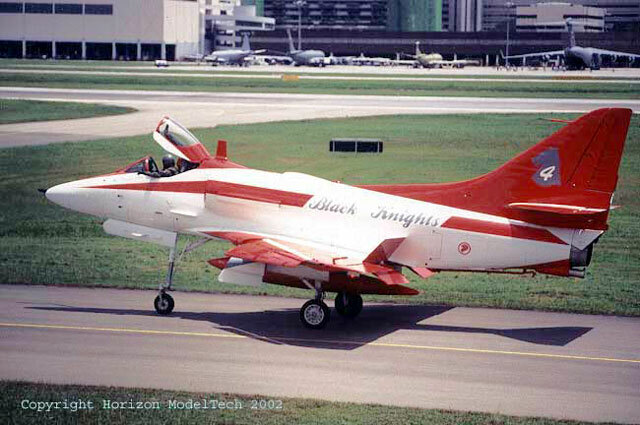 Investigation into the crashes found that the Wright J65 turbojet engines used by the Skyhawks were too old, and the RSAF decided that the time had come for a replacement if the Skyhawks were to be used for any longer. A search for a suitable replacement was then carried out, and the choice fell on a non-afterburning version of the General Electric F404-GE-100D turbofan. An ambitious two-stage upgrade program was launched in collaboration with the local aerospace industry, including re-engining the entire A4S-1 fleet, followed by an avionics upgrade to bring the avionics of the RSAF’s Skyhawk fleet up-to-date These culminated in the A-4SU Super Skyhawk, which entered squadron service with 145 Sqn in 1989. 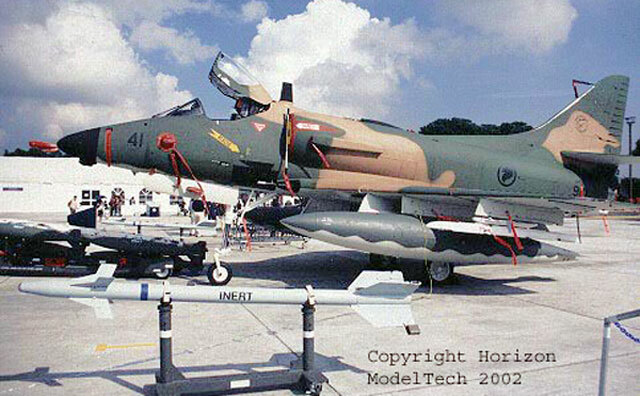 By the early 1990s all 3 squadrons were thus re-equiped, with the last of the venerable A-4S being retired in 1993. Airspace in land-scarce Singapore became increasingly congested, thus leading to an ever-shrinking area where the RSAF can conduct it’s training. Normal training is conducted over the South China Sea, and limited use of airspace and training grounds over Malaysian and Indonesian airspace. As such, it became imperative for the RSAF to source for training grounds overseas, through agreements with the host governments. In the 1990s, the RSAF decided to base a detachment of Super Skyhawks overseas for its advanced pilot training program. Australia was approached for the leasing of facilities at Amberley, Queensland, but the Australian government rejected this over noise considerations, while Singapore rejected Australia’s counter offer of facilities in Woomera in South Australia due to the distance from Singapore. Finally, in 1998, the French government stepped in with an offer of facilities at Cazaux AB in the south of France. A 25-year lease for basing rights of 18 aircraft and around 250 RSAF personnel and their families was signed later that year. Back in Singapore, 143 Sqn disbanded in 1997 and its aircraft were handed over to 150 Sqn, which had given up its SIAI-Marchetti SF.260 basic trainers. The new squadron then took up the role of advanced jet training, using its aircraft as a lead-in fighter trainer for RSAF pilots. This made it the prime candidate for moving to France, and the first of 18 aircraft were “packed” and sent to France by ship in mid-1999 as part of the RSAF’s Advanced Jet Training Program. The RSAF has had long-standing links with the air forces of other nations, and as such the Super Skyhawks have taken part in several exercises with the air forces of nations around the world, both locally and overseas. These range from the Commando Sling series of exercises with the USAF in Singapore, Exercise Cope Tiger with the Royal Thai AF and USAF in Thailand, Exercise Pitch Black with the USAF/RAAF in Australia, and the Five-Power series and air and naval exercises (ADEX, Starfish and Flying Fish) with the air and naval forces of Malaysia, the UK, Australia and New Zealand. Recently, the RSAF’s French-based Skyhawks have taken part in the ODAX series of exercises in France. RSAF Skyhawks have also supported Singapore army exercises in Queensland, Australia, operating out of Rockhampton airport. A-4S Skyhawk 607/145013 at the RSAF Museum, Paya Lebar AB, Singapore. 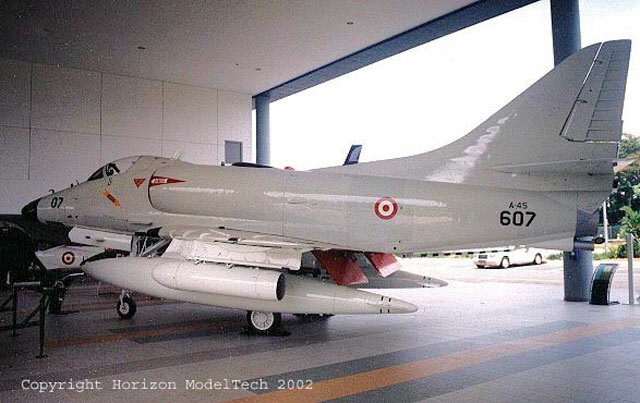 This example is painted in Light Gull Grey over White, the scheme carried by the RSAF Skyhawk detachment in the US in the 1970s. Initial RSAF variant. These aircraft were built from A-4Bs bought from MASDC in the early 1970s. These aircraft were rebuilt with Lockheed’s assistance together with it’s Singapore subsidiary, Lockheed Air Services Singapore (LASS). 51 A-4S and TA-4S were built between 1974 and 1977, with 6 built in the United States and the rest assembled in Singapore. 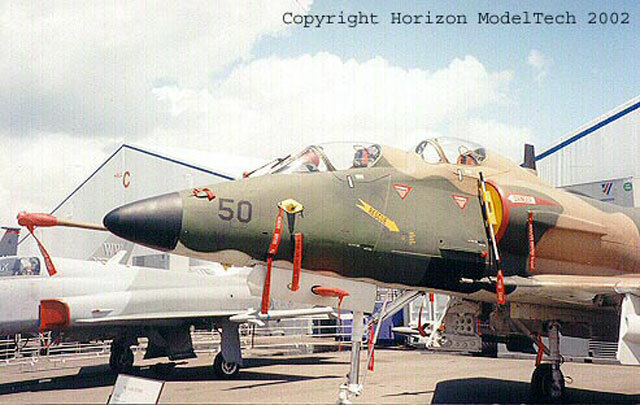 These aircraft had over 100 modifications from the original A-4B, including a longer nose housing a new comms/nav package, 5 stores hardpoints instead of the usual 3, a saddle type ADF dorsal hump, cockpit armour plating, spoilers, cranked refueling probe, Sidewinder capability, brake parachute housing below jetpipe and 30mm Aden cannons in place of the Mk12 20mm cannons. All aircraft from the second batch of airframes onwards were built to this standard. All A4S-1s and most of the TA4S-1s were ex A-4Cs. These were rebuilt mainly into the same standards as the earlier A-4S, but retained the 20mm cannons and A-4C nose of the original Skyhawk. Due to serviceability problems with the Doppler sets, these were also not retained from this batch of Skyhawks onwards. All A4S-1/TA4S-1s were serialled 9xx (eg. 918, 950). The first example joined the RSAF in the early 1980s. Late in their service lives these aircraft acquired Radar Warning Receivers on the nose and above the jetpipes, while chaff/flare dispensers were fitted to both sides of the arrestor hooks. 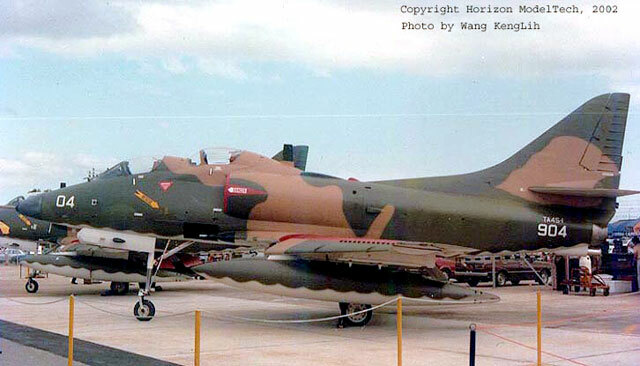 Prior to the mid-1980s, the RSAF had no in flight refueling capability, so it was not unusual to see RSAF Skyhawks (both A-4S and A4S-1) during this period having no probes fitted. A-4SU Super Skyhawk 941/145071. Note the auxiliary inlet next to the main intake. This is found only on the left side on all F404-engined Super Skyhawks. The final guise of the RSAF Skyhawk. In 1986 a two-stage upgrade program for the A4S-1/TA4S-1 fleet was initiated by Singapore Aircraft Industries (later Singapore Technologies Aerospace or STAe), in conjunction with the RSAF. The first stage included a new engine to replace the old and underpowered J65 turbojets. A non-afterburning General Electric F404-GE-100D turbofan was selected. The new engine necessitated some changes to the inlet to be made, along with fitting new engine mounts, air turbine starter, hydraulic pumps, refrigeration units and oil cooler. Two prototype aircraft, a single and a twin-seater, were converted and designated A4S-1/F404 and TA4S-1/F404 respectively. The first flight was made by a single-seater serialled 919 on 19 September 1986 and was designated A4S-1/F404 (unofficially designated A-4U). During flight tests the new engine demonstrated vastly improved performance, including outrunning RSAF Northrop F-5 Tiger II chase planes! The second stage involved replacing the outdated avionics on the aircraft. Much is still unknown about this aspect of the upgrade, although it is known that the new avionics package includes a Ferranti 4510 HUD, Litton LN-93 INS, mission computer, MED-2067 MFD and processor, Bendix flight data recorder and a laser seeker in the nose. Singapore acquired unique twin-seaters for its Skyhawk fleet. Instead of the standard single canopy trainer, Lockheed chose to design a totally new nose for the TA-4S. A 28-inch fuselage plug was inserted into the front fuselage, and a second, separate cockpit added for the instructor, with a redesigned, outward-bulging rear canopy (not simply a second single-seater canopy as its commonly believed) to enable better all-round vision for the instructor. The reason for this is unclear, we have heard 2 reasons for this: Firstly, the RSAF’s fleet was made up of J65-powered aircraft, while all trainer Skyhawks (TA-4F/J) were being powered by J52 engines Thus, to avoid having a Skyhawk fleet comprising of aircraft with 2 different engine types, Singapore elected to customize it’s own trainers. Another possible reason was that Singapore wanted more trainers than the US was willing to supply (at that time TA-4F/Js were still a mainstay in the USN), therefore leaving Singapore with no choice but to build it’s own trainers. Whatever the reason, the RSAF has ended up with what must be the most unique Skyhawks ever built!